So, this horse has a bit of a history behind it. Do you know the feeling of frustration when you find a perfect pattern, and want to get it NOW to cast on as soon as you can – and things get in the way, and it’s all delayed. And you’re so upset, that the feelings transfer on the project, and in the end you don’t want to make it after all? That’s how I felt with this horse. According to Chinese calendar 2014 is the year of blue wooden horse. 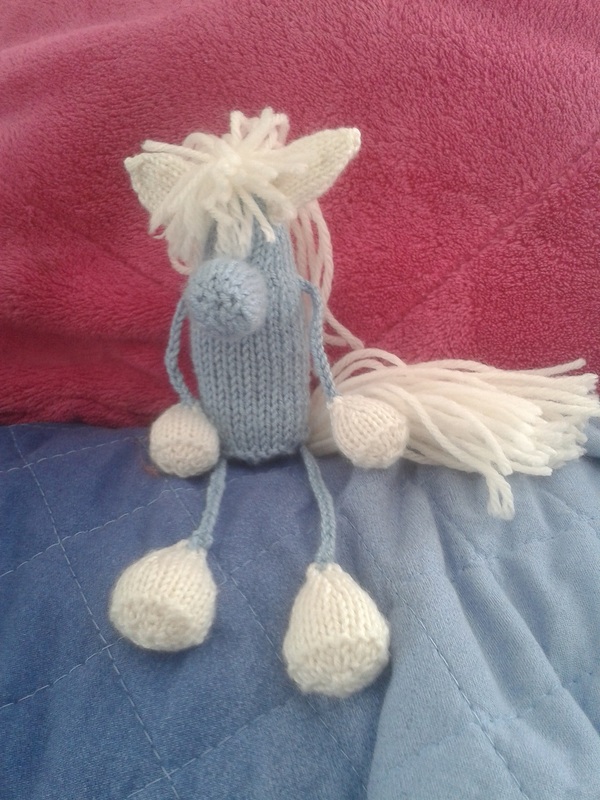 Wooden is out of my range, but I figured some time in September, that I could knit or crochet a few horses as souvenirs. Back in Russia, where I come from, for some reason it’s very popular to follow this Chinese year zodiacs. I guess this way, each year everyone has an easy way out of selecting gifts, especially for people we’re not too close to (we give gifts for New Year’s, not Christmas. Never mind the fact, that usually Chinese new year is usually some time in late January-February. It it not a logical tradition, I know). So symbols for next year are sold on every corner, in every shape and form, material, size possible. Some people also dress in the appropriate colour for the New Year’s celebration, cook foods that would appeal to the animal of the year, ect. Anyhow, I wanted a pattern for cute quick gifts and a I couldn’t find anything I liked. So I let it be. Now, a week before New Year’s eve, I come across a perfect one. First just a picture of a ready item. Couple hours of search – et voila! I find the pattern for sale. I’m ready to cast on – but things go wrong and I have it a day later. Not too long, you’d say. I know. But I was soooo excited and then sooooo disappointed, that when I had the pdf, I couldn’t bring myself to cast it on. But now that a few days have passed, I did – and I quite like it. I also was finally forced to learn the magic loop technique. I hate dpns dearly, and for the past few years was happy with 2 circulars. This time, I didn’t have 2 circs in the right size, but the one I had had a long cable. So I did it. Sat down, watched a youtube video and now I know how to do it. I don’t know why it seemed so daunting and confusing before. Just another reminder not to be lazy about learning new stuff!! When you do, it feels so good. Update: I made four of those in total, as gift for my son’s teachers. 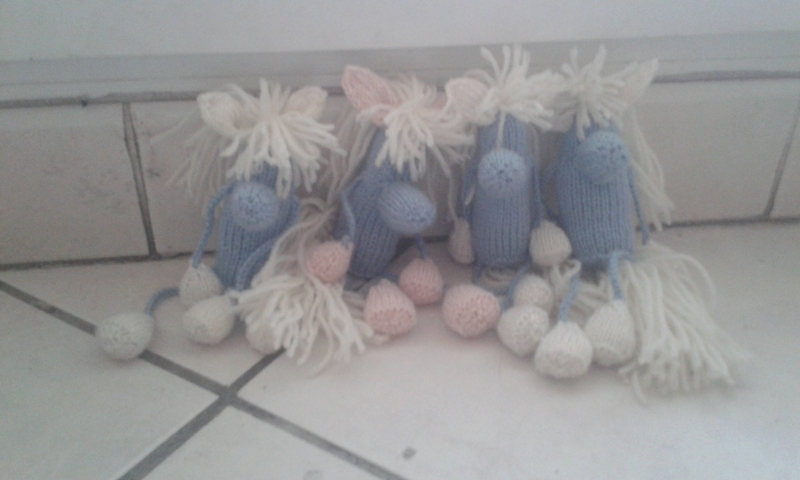 I don’t think I will be making any more in the foreseeable future – so many cute patterns out there to try out! 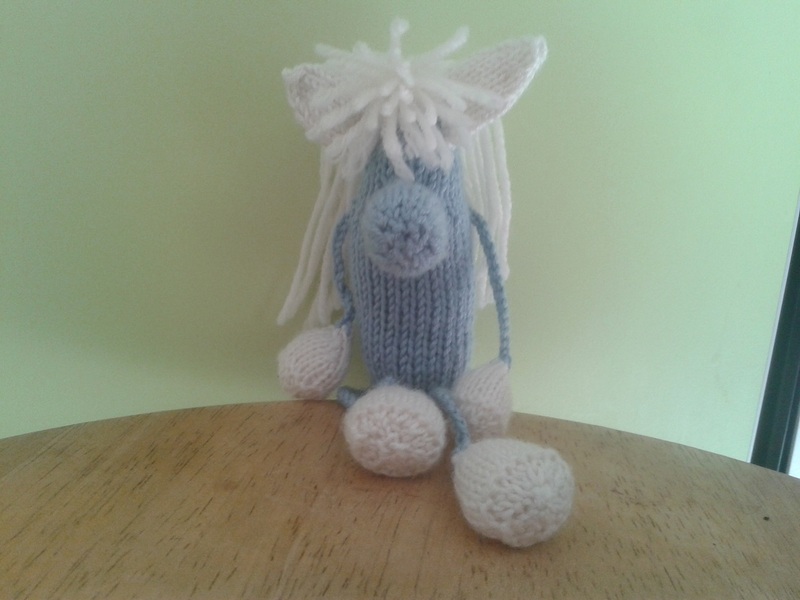 Separator image Posted in My kniting & crochet and tagged with horse, knitted horse, knitted toy, year of horse.